RecallChek™ is the first service for consumer recalls in the United States and has compiled over 210 million recalls from public records, to create a fail-safe system to check for dangerous flaws with home appliances. 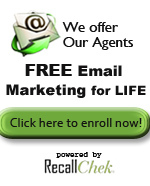 Click this button for more information about RecallChek™. Your 90 Day Limited Mechanical and Structural warranty comes with your home inspection. This warranty is valid 90 Days from the date of inspection or 22 days after closing whichever comes later. You will always have at least 22 days worth of coverage. This warranty covers repairs to items the Home Inspector has found to be in good working condition at the time of inspection and are specifically listed within our warranty. You will never have a deductible to pay. Claims will be handled within 72 hours of complete submission. This warranty may work in conjunction with an existing warranty. With every full home inspection, we have Sewer Line Protection from SewerGard- the world leader in underground repair coverage. Buy with confidence and worry less knowing that main water and sewer collapses and breaks are covered, up to $4000. *See policy for complete terms and conditions. 5 YEAR PROTECTION FOR YOUR ROOF! For a period of 5 years following the inspection, protects against new leaks in the roof of the home. After deductible, repair costs are covered up to $3,000. WE DON’T MISS A THING! If mold is found in your home that was not present at the time of inspection, you are covered for remediation, up to $2000. Our Residential Home Warranty Services include: HVAC, Plumbing, Electrical, Water Heater, Sump Pump, Sewage Pump, Well Pump, Termite Treatment, Exhaust Fan, Dishwasher, Garbage Disposal, Microwave, Range/Oven, Trash Compactor, Refrigerator, Whirlpool Motor, Roof Leak, Water Softener, Drain Line Stoppage, Washer/Drier, Garage Door Opener and Springs, Alarm System, Instant Hot Water System, Freeze Damage, Central Vac Systems, HVAC Annual Maintenance. You will receive 18 months of coverage for the price of 12 months for your first year when you purchase a complete home inspection with Atlantic Home Inspections LLC.